"Every individual will make 16 choices in their lifetime that will forever alter the course of humanity; no more than 16, no less than 16. These choices will be small, and at the time of decision, will mean nothing. They won’t have to be choices which result in action, as they could be choices that result in inaction. But months, maybe even years along the way, when the full impact of your decisions and the chain reaction of events they have caused are felt...you may have been the one who caused the end of the world. And you will never know..."
--Note: This covers Cypher from day one of his registration on the subplots, up until the hiatus taken from DIVERGENCE as a whole for the last two years. I'll be picking up my character's story just after he lost all admin powers and wakes up in game thinking its reality, and that his character is actually himself. He has no knowledge of his infection nor his 'powers', nor does he seem to be able to recollect anything regarding his past responsibilities within 'The World'. In fact, his real body is currently in a comma, though not in an official U.S. hospital. Instead, upon his pseudo-deletion, an unknown group has seized his body and taken it elsewhere. They were last spotted leaving Mexico not too long after Cypher's character logged back in for the first time in three years, right before his drain. Also, if you ever wondered what my initial registration on the subplots looked like, CLICK HERE and prepare thyself for a barrel full of lolz. Cut me some slack though; I was only 15! When first logging on to ‘The World’, Cypher’s real world counterpart was merely fifteen. At that point in his life, he indulged in lots of heavy fantasy gaming, either coding his own or playing the best one’s available for both fun and programming education. One particular series called ‘Greatest Fantasy’ featured a plethora of installments, none continuing and all set in new worlds with new characters, and their shared struggle to save the world from impending doom, either from some bad guy with magic or something really bad nature produced itself. Swords and fighting was the main serving of the game, with some great plotlines and magic to boost. One of them in particular – Greatest Fantasy 7 – featured the main villain as a super powerful universe altering swordsman by the name of Sephiroth. He idolized his every move, saying and action, and as such, modeled Cypher initially after it. Like the character he wore mostly black, leather pants and jacket covered by a long black coat. Gloves and boots followed the same theme, although grey would briefly break the overall black pattern with a few metallic shoulders pads, and his hair long, flowing and silver. Although never fully achieving his ‘dream look’ due to his class having no real weapon resembling a seven foot katana, he was very content, and would don this appearance for many years within ‘The World’. However, as his role with CC Crop grew bigger and his promotion as Administrator came soon after, he felt it was time for a fresh start. Although the changes would be somewhat drastic, he would still retain the same appearance picking standards as when he first signed up, choosing yet another infamous videogame character to look like. 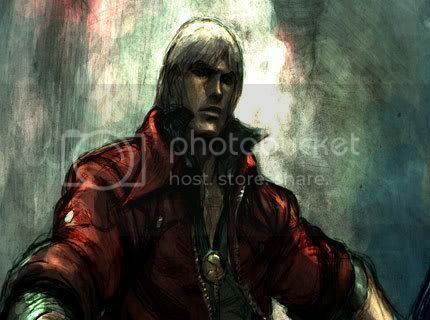 This time, it’d be the gun toting, smack talking, and lady killing Dante from the series ‘Devil’s Never Cry’ that’d he’d embodie, down to the ‘T’ (minus the gun’s, of course). His flowing white locks would now be cut short, hanging unevenly at his ears, neck and shoulder. Ditching black for gray, he’s now roll the sleeves of his new crimson coat, as well as keep it more open and less restricting. His black gloves remained, but he’d opt for a sleeveless pair. Finally, a thick pair of belts hung loosely from his hip, intertwining in order to provide double the amount of items held. Up until his current present Cypher dons this outfit, although as of recently, those lucky enough to spot him would notice a faint glow in his eyes, a dark orange slowly increasing in brightness with time’s passing. The beast that lurked beneath would soon come forth. Cypher’s first years within ‘The World’ would have the youth running around in an absent minded fashion, his geeky and nerdy curiosity over everything that was this new universe overwhelming his battle sense. As such, he was initially considered a disposable player, labeled useless by those around him with a higher level. Rather than grinding out for hours in order to level up, Cypher would often simply hang around, his vision never tired of appreciating the plethora of eye candy CC Corp had developed for his appreciation. Simply existing in this new world was enough to make the teenager happy, whose concerns over high school seemed to fade away whenever it was time to adopt his alter ego. Howe ever, as he slowly assimilated the game’s more battle orientated culture, he grew more cunning and calculated than before. He was almost more reserved with his words and commentary, no longer simply engaging anyone in sight for meaningless conversation. It’d be during this self imposed molding period that he’d fall under the eye of the founder what would become one of ‘The World’s’ most successful clans: the Army of Darkness. Intrigued by the raw potential, he’d take him and a few others still somewhat new to the game under his wing, teaching him the very basic and core skills needed to hold one’s own in the rougher parts of ‘The World’. During his beginnings within the clan, his attitude would change even further, a not-so coincidental event that took place alongside a new perspective gained regarding his new school. Now in his junior year, he considered himself a bit more ‘mature’ than before, thus spilling over to his online persona. At this point in the clan’s history, Sephiroth no longer ruled, and instead a twinblade by the name of Angelus took his place. Brash, brave and somewhat nonconventional, the party hearty leader had inspired Cypher to be more confident in his own skills, which had now flourished somewhat. With his rapid increase in level and increased interest in the game, he’d soon shoot up the ranks within his clan and the game itself; by the time his senior year came, he had become a moderator within the game the new leader of the clan. Much more mature than when he had first signed up in the ranks, he led through example, often choosing to involve himself directly with whatever conflict that dare threaten his troops. Working for CC Corp would soon become a full time job, and by the time college arrived, he had already discovered his nitch. Squeezing classes in between working hours he continued his successful string of promotions, and within months, his constant winning record had made the Blademaster somewhat cocky; these would be his best years. However, once his high point was reached, the rest was downhill. Soon after his rewarding promotion as Administrator of ‘The World’, the many alarming discoveries made regarding some CC Corp employees would force the youth to be a bit more reserved in his efforts. Being one to strive for righteousness – at that point in his life, at least – he would begin to spy on the corporation for outside groups, often meeting with them to rely them any new information discovered. He felt the heat coming from the administration, but so far, he had done well to evade. To his friend’s he’d become a bit more distant, an attitude reluctantly adopted after he realized the possible danger he could put them in. Finally, as the his last days as Administrator neared to an end, he had been known to become angered easily, snapping out to most and being quick to become hostile if anyone bothered to interfere with his attempts. Due to the overwhelming pressures from being caught, he’d regretfully resign as leader of the Army of Darkness, leaving the responsibility to his own ‘apprentice’: Sasuke, the whacky ninja. Shortly after the announcement, the clan would cease to hear from their former leader, thinking him to either be deleted or no longer active. This would be when he chose exile, fleeing the country just in time to escape the thugs sent after him. While on the run in South America, he had suddenly mutated into this scornful, resentful person, no longer caring to right the wrongs of society around him. Instead, he would fight his hardest to simply get by, his moral fiber shattered when his life was almost taken over a mere game. During his tour, he’d also learn to resign himself of most emotion, hardening his will through the harsh Capoeira training endured. This was what happens when children are forced to grow up. When they are forced to be men, when rifles are shoved in their arms. Rather than graduating from college with high honors and continuing his high paying company job with one of the world’s largest computer related corporations, he was now on the run from them and fearing his life, forced to acquire cheap martial arts training and basic gun knowledge through half witted locals. During his time spent aiding the local fighting forces, many atrocities were witnessed; he’d never be the same again. One final log in would be attempted, but in an almost movie-like fashion, failure would ensure to present itself in the middle of his attempts. Just as the character known as Cypher was almost released from the almost impenetrable field he had been housed in this entire time, his Twilight Infection would be too overwhelming and unbearable. Finally, after years of fighting it, he would be consumed; Cypher was now a part of ‘The World’. What kind of new fiend would emerge from such a tortured mold? Only time would tell. Last edited by Cypher on Wed Sep 17, 2008 2:59 am, edited 93 times in total. Last edited by Cypher on Wed Sep 17, 2008 12:55 am, edited 45 times in total. Last edited by Cypher on Wed Sep 17, 2008 12:55 am, edited 3 times in total. Last edited by Cypher on Wed Sep 17, 2008 3:18 am, edited 8 times in total. Cypher’s return to ‘The World’ was marked with an obsession to hunt down hackers, specifically those believe to possess information he needed. During one specific battle, Cypher is forced to data drain his opponent, cleansing him of the hacks he once possessed. However, where his body once stood were now several hacked items. Amongst them was a glove, one which worked outside of the game’s boundaries, serving not as an official weapon for an official class, but as a weapon for hackers to use against authorities if needed. After reporting his finding to his admin friend, the glove was reformatted to loose part of its hacked coding in order to prevent detection, while still retaining its powers. The glove itself contains several levels of power, most which remain untapped. For most part of his time spent in ‘The World,’ the player known as Cypher had taken up the role of an in game admin, albeit due to his low level, only had most powers granted to an admin, but not all. As time progressed and secrets were uncovered, it became apparent a controversy took place inside the staff, one bigger than himself. Unfortunately for him, he had been caught snooping around, uncovering information that could damage several parties high up. As a result, his character was pursued. As he neared deletion, he entrusted several admin friends with his information, which he later contacted to get his powers back. Although he didn’t retain all of them, since some would allow him to be immediately traced, he does have an array that would allow him to survive fights with both regular players, as well as hacked and even lower level admins. Last edited by Cypher on Wed Sep 17, 2008 3:02 am, edited 1 time in total.